Spring is in the air, though clearly some parts of the world don’t seem to be so fortunate. Nonetheless, it seemed to be a good time to try out a few light, fresh fragrances that epitomize the upcoming season. One, in particular, caught my attention: Pure Mariposa, the new perfume created by the Spanish niche perfume house of Ramon Monegal for the American luxury department store, Neiman Marcus. Pure Mariposa is a bespoke perfume exclusive to the store and was released in February 2013. 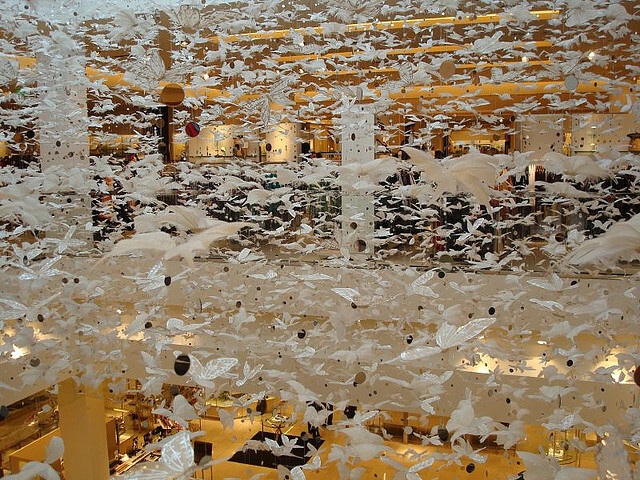 One Neiman Marcus store with a floating butterfly decor. Source: Flickr. 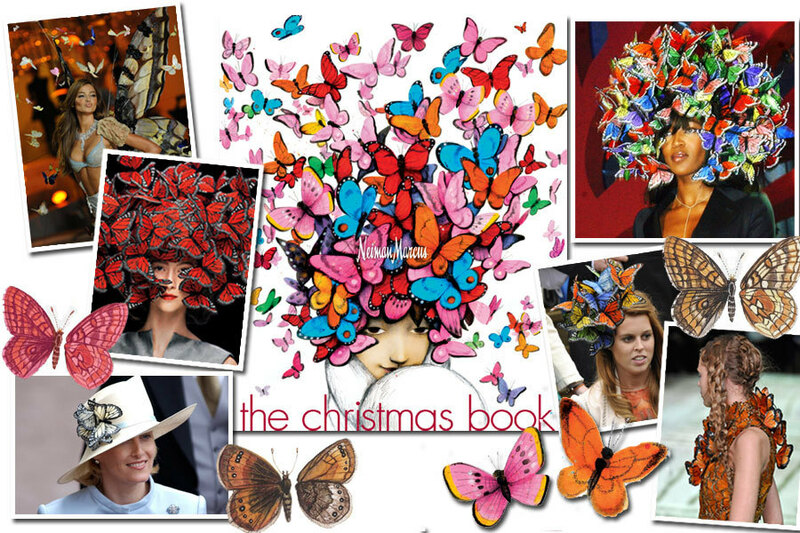 “Mariposa” means butterfly in Spanish and is not only a reference to Neiman Marcus’ happy, bright symbol of butterflies but the perfume’s point of inspiration. Pure Mariposa will offer a floral-nectar accord with a festive tone in a dew-covered green forest, surrounded by a breeze of ozonic air, on a rich bottom accord of amber and musk. Fresh festive colorful: orange, grapefruit, bergamot. Fruity vital, cheerful: yuzu, black currant, plum. Green natural: oakmoss, grass accord, fig. Floral rich, elegant: Osmanthus, jasmine, lily of the valley, rose wardia, tuberose. Woody powerful, harmonious: sandalwood, cashmeran (m), iris, anchouli (m). Silky sophisticated, majestic: peach, tonka bean, amber. I’m not a fan of synthetics — and particularly not of calone — so the listing of six different aromachemicals gave me great pause. I approached Pure Mariposa with some trepidation and first just gave the small decant a sniff. It was absolutely gorgeous in the bottle! Let me repeat that again: gorgeous! A beautiful scent with fresh, sweet, fruited and bright green notes. I could detect grapefruit that was yellow and sweet, not red and tart, along with fresh yuzu, juicy, sun-ripened yellow citrus, sweet (non-artificial) melon, sweetly green lily-of-the-valley, and fig. There was also that cheerful, happy note of freshly cut grass that is so evocative of the summer and sunshine. I was thrilled, and quite relieved. Then, I put it on my skin. And it was a very different story…. A huge waft of synthetics and chemicals immediately hit my nose, followed quickly by incredibly dry, pungent, bitter oakmoss and equally bitter grass. There were also a panoply of sour notes from the citrus elements which contrasted strongly with the sweetness of the melonal aromachemical. The pungently dry aspects of mineralized oakmoss were side by side with sweet melon and sour citrus — all on a base of synthetics and artificially peppered woods. Soapy lily-of-the-valley lurked in the corners, adding a different sort of green and white impression to the whole ghastly mélange. I don’t know if my skin magnifies synthetic aromachemicals or if there is simply too damn many of them in Pure Mariposa, but the contrast between the beautiful brightness of the perfume in the bottle and its manifestation on my skin was a huge disappointment. That robust underpinning of aromachemicals remained long after the perfume’s opening changed to something much less bitter and dry, and much more melon-y sweet, metallic and airily green. Ten minutes in, the perfume became simultaneously even more bitter but, also, more sweet. The very dusty, dry, grey mineralized feel of the oakmoss competed with the green lily-of-the-valley’s sweetness, the freshness of yellow citrus and the feel of a green honeydew melon mounted on aquatic underpinnings of calone. The calone is just brutally strong in this perfume and truly dominates everything at its heart, while the melonal runs over the top of everything like a bulldozer. Yet, at the same time, there are synthetically peppered woods with a definite metallic, somewhat alcohol-like undertone. Two hours in, I’m surrounded by a cloud of calone and melonal: aquatic melon freshness is everywhere. Within the cloud projecting several feet from my arm, the bitterness of very dry oakmoss remains but it’s underneath and on the skin, not wafting around. Some vaguely amorphous, abstract floral notes dance around, joined by occasional, fleeting flickers of powder and soap. At the same time, there is that annoying metallic, alcohol note that pops up every now and then, like a ghost flitting about under the endless mushroom cloud of fresh melon. The metallic note is not continuously present, but it never completely leaves, either. My mind is utterly confused by the endless contrast of bitter and sweet, dry and fresh, sour and aquatic, flowers and alcohol. And the perfume remained that way for hours and hours without any fundamental change. The sillage dropped after about four hours but, like many perfumes with aromachemicals, it has persistent longevity. On my perfume-consuming skin, it lasted about 9 hours until I simply couldn’t take it any more and desperately sought a change. Yes, I washed it off. There is only so much melon and metallic alcohol a person can take, after all! fresh but weird scent…drydown..is a cloying nutty smoky (think ur fireplace and throw orange peels in and let them dry out…took days to take off my skin…good last power..but the scent is kinda like beautiful(C KLEIN)..but with burnt notes…im not fond of. I’m sad to say that I think their experience was still better than mine. Ramon Monegal chose to also list several of the synthetic molecules: helional (a green hay-like grassy odor), melonal (excatly [sic] what it says), calone (usually the worst marine-ozonic offender), ultrazur (another fresh-ozonic beast, sweeter and greener than calone). It sounds like a warning sign and it took all my trust in Ramon Monegal’s perfumery skill and style to make me take that first spritz on my wrist. I shouldn’t have worried. While Pure Mariposa opens with a burst of sharp and fresh citrus oil, I don’t smell the sea or any rotten melons; just air from a window opened early in the morning, letting in cool air. It’s a mix of bright yellow and bright green: the freshly mowed grass, a glass of freshly squeezed grapefruit juice, meyer lemons arranged in a bowl on the table. Then things become more floral as the day (and Pure Mariposa) starts to unfold. New blossoms open every day, white, pink, and orange. The heart is rather abstract, I can’t say “here’s muguet! there’s rose!”, but it is very floral, slightly honeyed (those fresh water molecules are gone and forgotten), juicy and a bit pulpy. I do smell quite a bit of peach and it goes hand in hand with a strong tuberose note. There’s a point that Mariposa becomes a blend of powder and tuberose, very feminine on my skin (dry and woody on the husband) and if you over spray it really takes over the room. On her skin, Ramon Monegal lasted 16 hours. In my opinion, that is further testament to the synthetic nature of the perfume since we all know that synthetics can make a perfume last forever — even when you wish the perfume would die, and die now. Clearly, something about my skin chemistry seems to turn aromachemicals into something pretty extreme. I was with two people who aren’t perfumistas, but who absolutely loved the scent of Pure Mariposa that pulsated in the air like a sound wave. They found it “fresh and sweet.” (Apparently, they love melonal more than I do.) Nonetheless, when one of them smelled it on my arm, they grimaced. Personally, I wouldn’t recommend this with a ten-foot pole unless you know ahead of time that you like synthetics, especially melonal and calone. Not for $200 a bottle. Oh, did I not mention the cost? It’s $200 for a 1.7 ounce bottle of eau de parfum. I won’t bring up Neiman Marcus’ pejorative nickname, but I think those of you outside America should count yourselves fortunate that this exclusive item is not available for shipping overseas. All in all, a huge disappointment. Pure Mariposa is an Eau de Parfum that comes only in a 1.7 oz/50 ml bottle and costs $200. It is exclusive to Neiman Marcus. Unfortunately, the department store will not ship or export the perfume outside of the United States. I went to the page and tried numerous different countries in the “Shipping to” link at the top, and each time received a message in the lower right-hand corner stating, “We are sorry, but we are unable to ship this item to _______[insert country’s name].” As for samples, I don’t see the perfume listed yet on any of the US perfume decanting sites.